Main St. showing 2nd floor walkway! American Press Travel News–July 4th, Crossville, TN. “Bob & Barb on the Road Again”–As my wife Barb and I continue searching and exploring interesting places to visit we felt that Morristown City, in Hamblen County, Tennessee would be a good one to visit within easy striking distance from our home on the Cumberland Plateau. 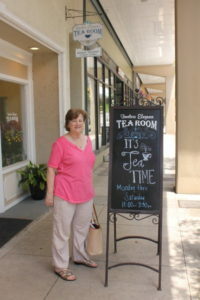 After calling Anne G. Ross, Director of Tourism & Program Director, Retire Hamblen County, she made it very easy for us to visit Morristown and see why it would be a fine day-trip for Crossville and surrounding residents. Upon arrival, and after working through Knoxville traffic we arrived in less than 2-hours to Morristown. First we checked in at the Hampton Inn-Morristown (West End) into a delightfully comfortable suite (terrific staff, by the way and quite excellent hot breakfasts too). A bit about this city that’s quite close to Knoxville: With a population of about 30,000, Morristown’s Main Street area, with an approximate area of a square mile, grew up around a waterway known as Turkey Creek, and the intersection of two railroad lines. In 1962, the creek flooded, nearly wiping out the downtown commercial district. 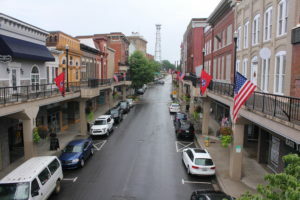 The city developed a plan to modernize Main Street by creating an “overhead sidewalk” that would turn the second floor of the existing buildings into a new “street”, while serving as a canopy for the sidewalks below. After checking in, we then walked and gawked at various antique and other shops, both at ground level and up the ramps to their elevated second story walkways. Yes, we made some great collectible, but usable finds for our home in Crossville, and during our stay, tasted delightful meals at places such as Jersey Girls with corned beef special sandwiches, The Little Dutch with their delicious salmon entrees’, Hillbilly’s breakfast spot for Spanish Omelets’, and we lunched at Timeless Elegance Tea Room with their famous Chicken & Dumplings, run by a dynamic duo Mr. Kelly and Howard Long (more details on dining experiences in, and all the other great attractions and places we visited in the 2nd edition of our visit, next week). Restaurants in Morristown were varied and quite excellent! For its size, Morristown has so many restaurants that for about one year you can dine at a different one every day if you so desire. After a downtown walking tour with Barbara Garrow, Director of Crossroads Downtown Partnerships’, we really got a good look of what a fine; progressive planned downtown can be in almost any small town America. For you sports lovers: In 1985 and 1987, Morristown had teams qualify for the Little League World Series; the 1985 team finished third. The Morristown teams are two of nine Tennessee teams that have advanced to the series in Pennsylvania. In 2006, Morristown placed fourth in the Little League Softball World Series. In 2007, Morristown won the Little League Softball World Series. Next issue we’ll present everything we just cannot fit in today including the 700-miles of shoreline of Lake Cherokee and the arts and drama programs! Go: www.tourism@morristownchamber.com for additional information. 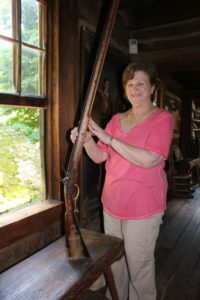 A facsimile of Davy Crockett’s flint-lock rifle. I told Barb to take it as a souvenir. 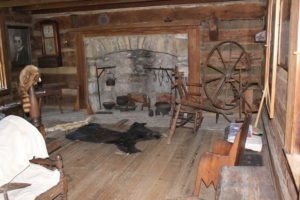 Davy Crockett’s family living room! Also served as a cooking room and workshop too!